2/7: Sunday Family Funday at Sioux City Art Center, 1:30-2:30pm price varies by project chosen. 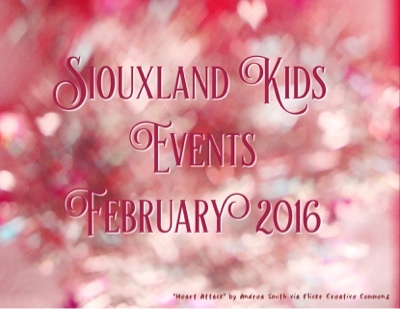 2/14: Sunday Family Funday at Sioux City Art Center, 1:30-2:30pm price varies by project chosen. 2/21: Sunday Family Funday at Sioux City Art Center, 1:30-2:30pm price varies by project chosen. 2/28: Sunday Family Funday at Sioux City Art Center, 1:30-2:30pm price varies by project chosen.